Thrive! is a thriving and surviving future for all forever. Thrive! is building and achieving a vast, sustained human endeavor, a critical mass of positive human behavior. Thrive! is aspiration, vision, mission and call to action. It strives to energize and empower a vast, sustained human endeavor building and sustaining a thriving future for all (for people, communities, nations and world; for everyone and everything. 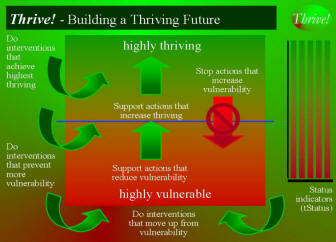 When successful, it is achieving a thriving future for all forever. Its vision is a surviving and thriving future for all forever. Its mission is to create and sustain large, positive and timely change that builds and achieves a surviving and thriving future for all forever. The Thrive! strategy is to have people of all backgrounds and generations join together in this human endeavor. It strives to motivate governments, private sector organizations and people to seek a thriving future and to work together to build and sustain that future. Key is people joining with Thrive!, networking, spreading the word, and taking positive action. Thrive! plays a shepherding, supportive role to ensure we stay true to the “thriving future” mission and our actions are positive and create and sustain positive change. Thrive!, achieving a thriving future forever, builds on our ability and willingness to shepherd our world to a thriving future. Builds on a 1000+ year and 50+ generation strategy. 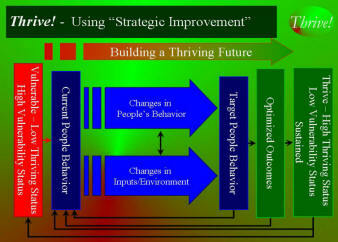 Builds on “levers” and “fulcrums”, enabling us to leverage our efforts to greater and longer lasting outcomes. Builds on “tipping points”, historical opportunities to make greater achievements. Builds on “next generation” strategies and tools, such as in viaFuture. [viaFuture.org] Builds on "eMedia" to expand reach and speed progress.